Next Layer: 5&1/4" by 2&1/2" piece of candy corn patterned paper, and use Scrap Happy Glue to add a 5&1/4" by 1" piece of grid patterned paper along the left edge....just leave about 1/4" peeking out, then glue this piece about 1/4" from the left side of the black swiss dot cardstock. Center Panel: Mat a 3&1/4" by 2&1/4" piece of grid patterned paper on a 3&1/2" by 2&1/2" piece of yellow cardstock. Wrap and tie a ribbon around the top. Then foam tape this piece to the card front. Cut two banners out of orange swiss dot cardstock and grid patterned paper, and glue under the left top edge of the center panel using Scrap Happy Glue. 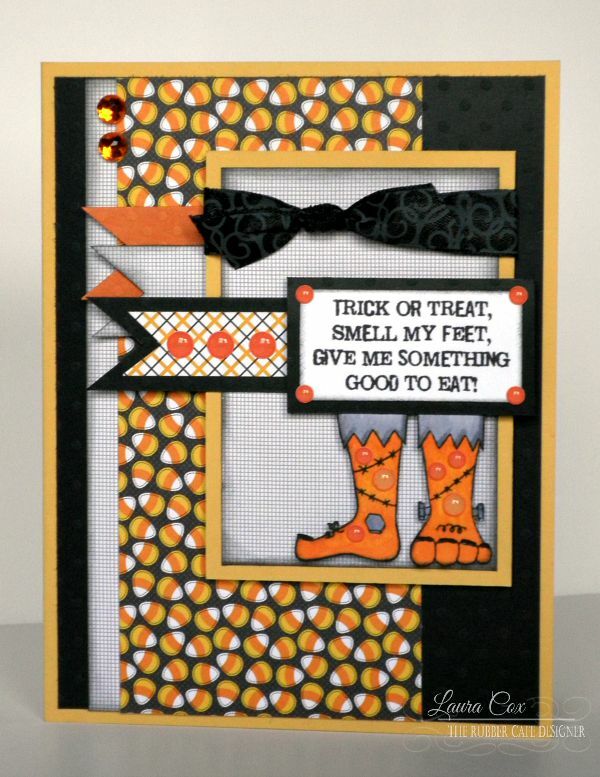 Stamp the sentiment and the monster feet using Memento Black Tuxedo Ink, and color feet with markers, then fussy cut feet out and trim and mat sentiment. Glue feet under sentiment piece and then foam tape to center panel of card. Add a banner of black swiss dot cardstock, and orange/black patterned paper to the sentiment, then add enamel dots to monster feet, sentiment and banner. Finish off with orange rhinestones at the top left corner. Quick Tip: if you like to add a little extra "spooky" to the project as I did....you can apply a little Black Soot Distress Ink to the paper edges on some of the pieces. Thanks for stoppin' by today.....stop back soon for more amazing inspiration from the team! !